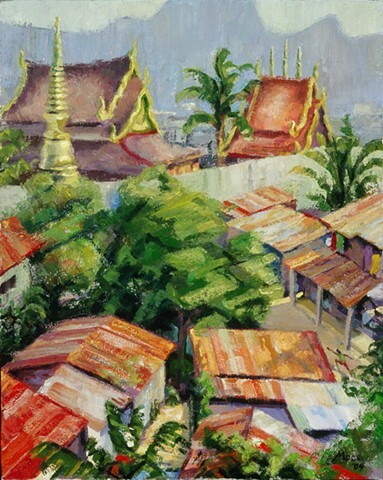 This was painted from a road overlooking a gully in Chiang Rai where a shanty had been built. On the other side of the shanty was a temple. The juxtaposition of the two was an irresistible motif, and the road where I painted was shady and secluded. Nevertheless, a small boy on a bike rode up and cheerfully demanded I pay him 10 baht (about a quarter) for the privilege of painting there. I bargained him down to five.